The database's current activities can be monitored through Directory Server Console or from the command line. Tips for tuning the entry and database caches to improve server performance are in the Red Hat Directory Server Performance Tuning Guide. Click Refresh to refresh the currently displayed information. For the directory to continuously update the displayed information, select the Continuous check box, and then click Refresh. Database Identifies the type of database being monitored. Configuration DN Identifies the distinguished name that must be used as a search base to obtain these results using the ldapsearch command-line utility. To improve the ratio, enable the entry cache auto-tuning. For details, see the corresponding section in the Red Hat Directory Server Performance Tuning Guide. 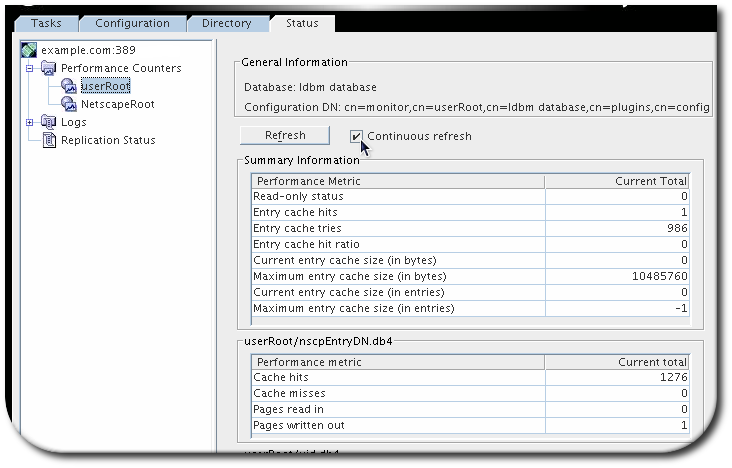 The size of the entry cache is set in the nsslapd-cachememsize attribute in the cn=database_name,cn=ldbm database,cn=plugins,cn=config entry. For optimized performance, enable entry cache auto-tuning. For details, see the corresponding section in the Red Hat Directory Server Performance Tuning Guide. Do not attempt to manage the cache size by setting a maximum number of allowed entries. This can make it difficult for the host to allocate RAM effectively. To improve the ratio, enable the database cache auto-tuning. For details, see the corresponding section in the Red Hat Directory Server Performance Tuning Guide.